We have again got internet access so we can update our journal. From Cania Gorge we travelled to Emerald in the central Queensland gemfields, a journey through undulating country with interesting changes in vegetation. Much better than the drive to the coast which was flat and very dry with not many trees. Along the way we had to contend with 53m long road trains that hold the centre of the road, or so it seems, making them look even bigger. The roads were quite good but in some places they reverted to outback Qld standards with narrow bitumen and very irregular surfaces. At Emerald we found a camp ground about 17 Km outside the town at lake Maraboon. A delightful place with plenty of trees on the shore of Fairbairn Dam (not sure of the spelling). Heaps of birds including many Rainbow Lorikeets that would eat out of your hand.We had to use our satellite phone to let our family know we were still travelling OK as we had had no mobile or Internet coverage for a number of days. From Emerald we travelled to Longreach, again through interesting countryside. 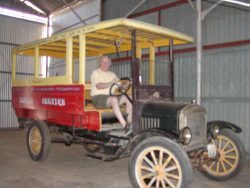 On this trip we had to overtake our first road trains but the drivers were very cooperative, keeping to the left to allow as much room as possible and acknowledged our “toots” of thanks with a headlight flash. We camped at Gunnerdoo Caravan Park as in “gunna do that one day” which is a very well run park with good facilities and as many trees as the dry region will support. They also have three spa pools which we enjoyed yesterday, in a warm sunny 29 degrees. (This was after rejecting “Nogoa Caravan Park”, which was exactly as the name suggests!! Today we went to the Qantas museum which was excellent and well worth a visit. Our visit started with a film on the origins of Qantas which was very informative and well narrated by Michael Catin, whose mother was one of the original Longreach employees (as a junior typist). After that we walked through the displays that had many audio-visual presentations by ex-employees on their experiences. There was also a film on the restoration of the first Qantas 707 and displays of early planes and equipment. It was especially interesting to learn about the two founders of Qantas and how they got together. Apparently one of them was a pilot in the 1st world war and the other chose to fly with them because “his plane had the least bullet holes”. The first business they had together was to find airstrips between Darwin and Brisbane for the planes in the first air race from London to Australia. They did this in a T model Ford over tracks that were just one horse pad wide! An incredible effort, but on the way they met a minister who had travelled in a similar vehicle from Melbourne to set up a mission in the NT! After this we visited the Stockman’s Hall of Fame which was also a very enjoyable experience. A very well put together exhibition in a way that celebrates our early pioneers and the hardships they endured and their resourcefulness, all housed in an interesting and well designed building. The displays acknowledged the role and culture of the aboriginal population, explained the early European exploration and then detailed all aspects of the development of outback Australia. Again many audio-visual displays highlighted and explained aspects of life in early Australia. There were also many short stories on unsung heroes of this period that amplified our understanding of the hardships and battles the pioneers went through. We spent hours here with our tired feet and backs being the only reason that we curtailed our visit. Tomorrow we go to Carisbrook Station and visit the site of the only fossil record of a dinosaur stampede which should be an experience. After that we go to Lawn Hill via Cloncurry and Gregory Downs so you may not hear from use for a couple of weeks as we will be out of Internet access in the real outback. 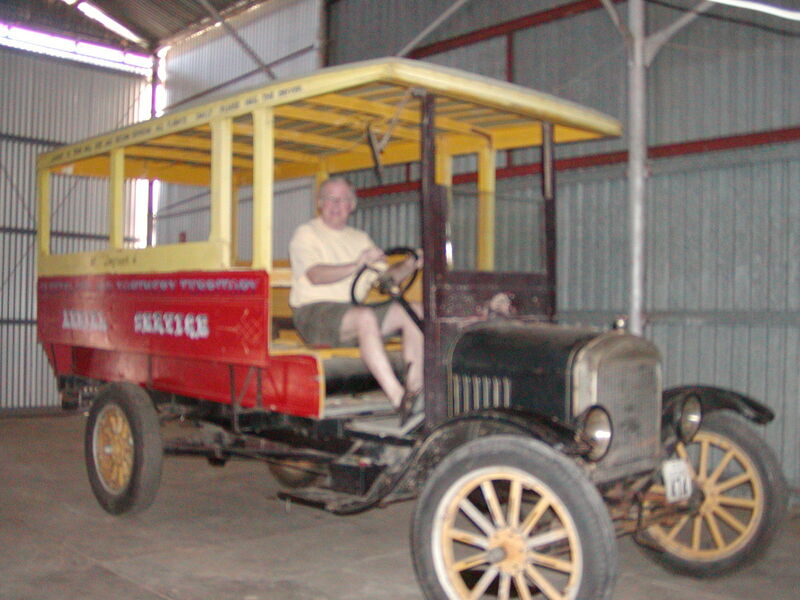 I guess it’s no good complaining about your 4wd if you’ve never travelled by Model T!!! How dusty would that be. We’re really enjoying reading about your travels. Rhon & Barry say hello and really enjoying your travels. Our big news is that we are finally going to be grandparents. Mans and Tigs are expecting a little baby on 19th February. We are soooooooooooooooo excited! Going to pick up Cam and Thieng on Sun and over to Yvonne’s for afternoon tea. Who’d have thought! Just come back from a 4 hour pamper package that Barry organised for my birthday, so think I am so relaxed, I will have to go to bed now *8pm). Miss you guys but feel like we are in touch when we read your blog. Thanks a lot for writing this, it was unbelieveably informative and told me a ton.